The health of customers and your business depends on proper sanitation. 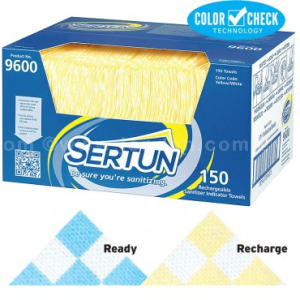 Sertun Rechargeable Sanitizer Indicator Towels will ensure you never wonder again if your sanitizer is out of spec or if your towel is effectively deploying sanitizer. Each 13.5” x 18” towel changes color from bright yellow to deep blue when the proper Quat levels are present in the sanitizing bucket and on the towel. Using patent-pending Color Check Technology™, Sertun towels will tell you at a glance whether you’re sanitizing at full strength.